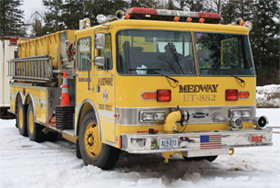 The Medway Fire Department was founded in 1973. Currently the department has a roster of twelve paid on-call firefighters including: the Chief, Deputy Chief, two Lieutenants, firefighters, junior firefighters, and traffic control personnel. 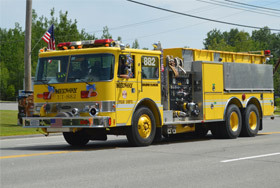 The Medway Fire Department covers the entire Town of Medway including Interstate 95 from Mile 242 to Mile 249. 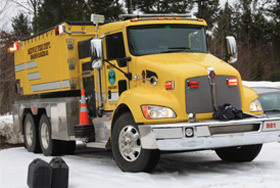 They also cover Molunkus Township, and provide/receive mutual aid from East Millinocket, Mattawamkeag, Millinocket and Sherman Fire Departments. The Department responds to an average of 90+ calls per year. 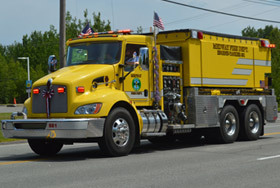 The Department houses three apparatus; Engine tanker 881, Engine tanker 882 and Tanker 884. Engine tanker 881 is a 2011 Fouts Brothers Kenworth. It has a 1250 gallons per minute pump and carries 3000 gallons of water. Engine tanker 882 is a 1987 Pierce Arrow. It has a 1250 gallons per minute pump and carries 2000 gallons of water. Tanker 884 is a 1990 Kodiac Top Kick. It carries 1,000 gallons of water.